2. 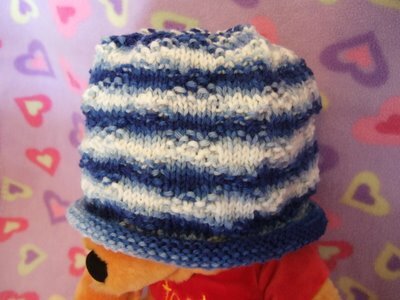 Free Pseudo-Patterns or Pattern Outlines can be found using the Free Pseudo-Patterns label. There are some things I prefer to do than others. 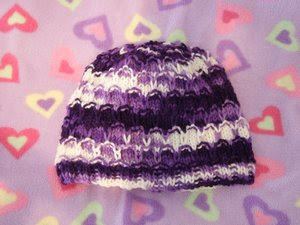 I prefer to knit than to purl. I prefer Cable cast-on to Long-tail cast-on. I prefer to cable front than cable back. 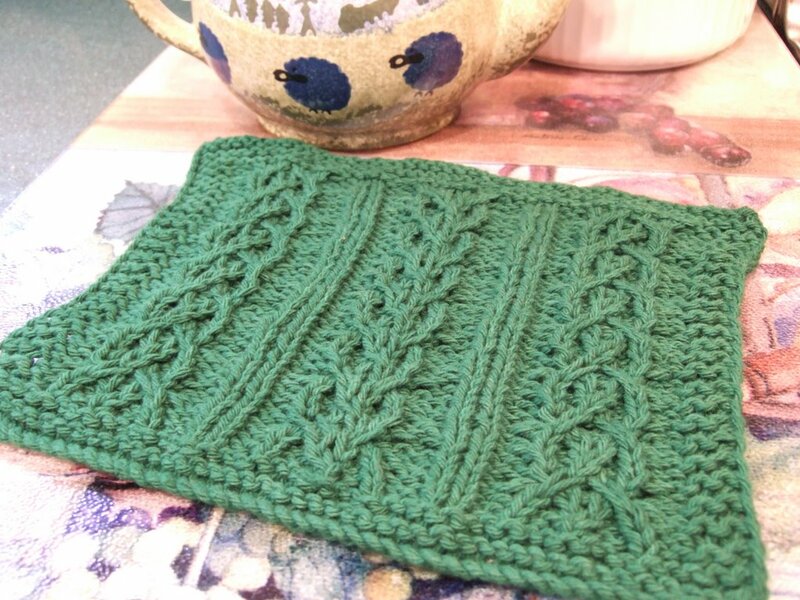 I prefer to knit through back loop than purl through back loop. And I prefer Right Twists to Left Twists. However we can't always do the things we prefer. 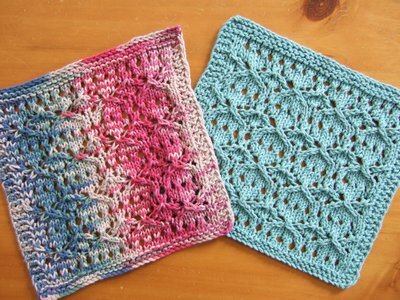 This little dishcloth pattern has a few Right Twists and Left Twists scattered about. 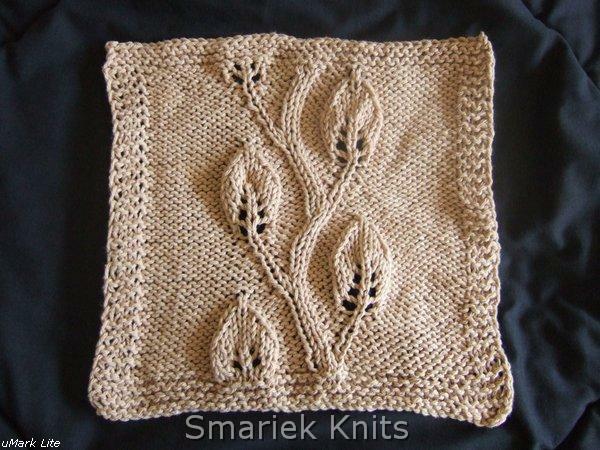 But I love the texture of the cloth, and think it shows up well with this variegated yarn. 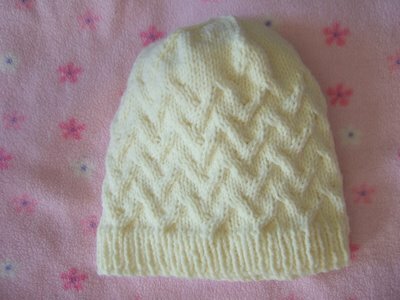 This is also the first time I've used Peaches & Creme yarn. My impression is that it is a smidgen softer than Sugar & Cream. 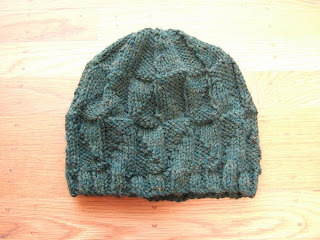 I wish the photo above was sharper; I'm not very good at taking photos of my knitting. I will admit that the cloth you see above is a bit sloppy. 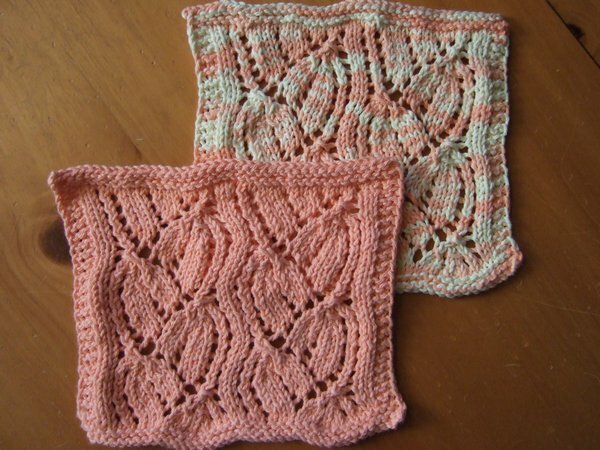 I will admit to intentionally knitting more loosely on the rows before a RT/LT row, because I know how unyielding cotton yarn is. 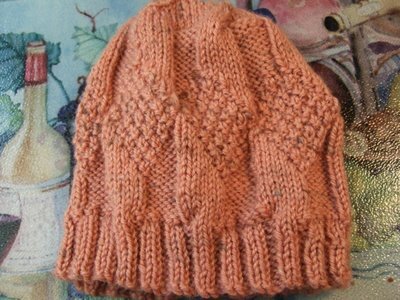 But I got my act together after the first repeat and tried to knit with a relatively consistent tighter hand. 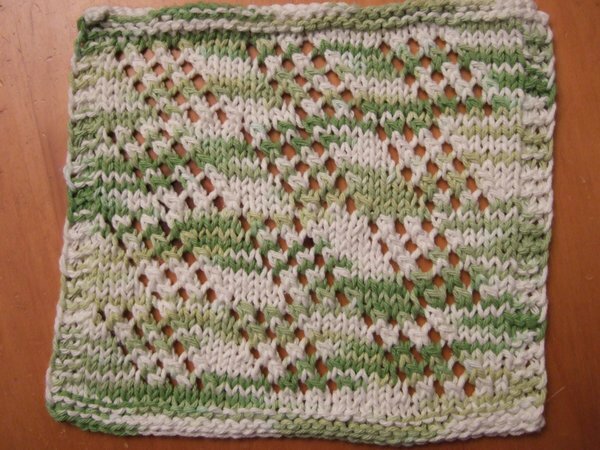 This dishcloth was my "car" project. 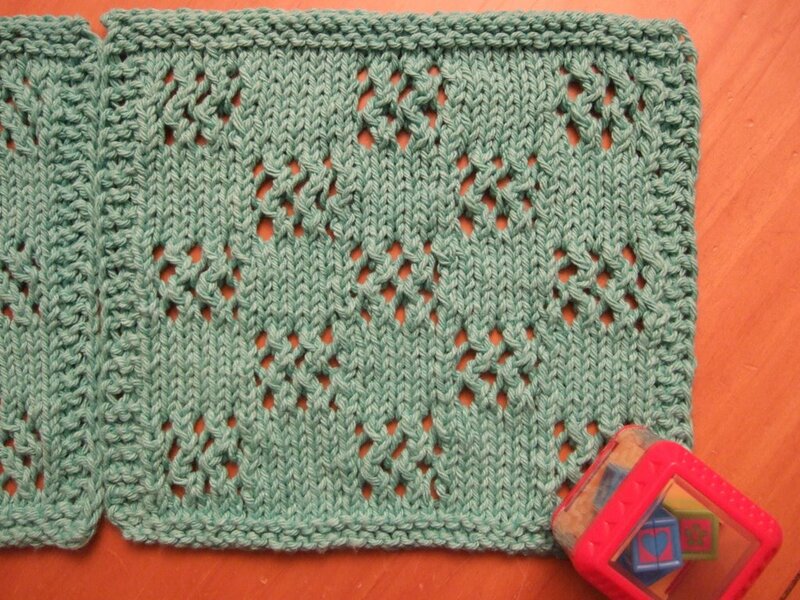 I kept it in the car to work on while I waiting for my 17 mos little girl to finish napping. She is the baby than never naps. We've been in a painful transition from 2 naps a day to 1 nap a day. And she resists taking nap, and boy is she ultra cranky/fussy when she doesn't nap. I'm afraid I have been using the car as a prop, to get her to nap; sometimes it works, sometimes it doesn't. 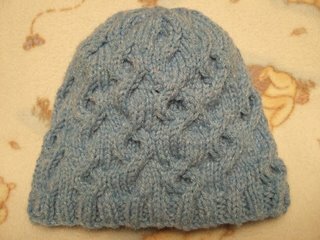 Using WW cotton yarn, and US7 (4.5mm) needles , CO 38 stitches. Repeat Rows 1-12 twice more. 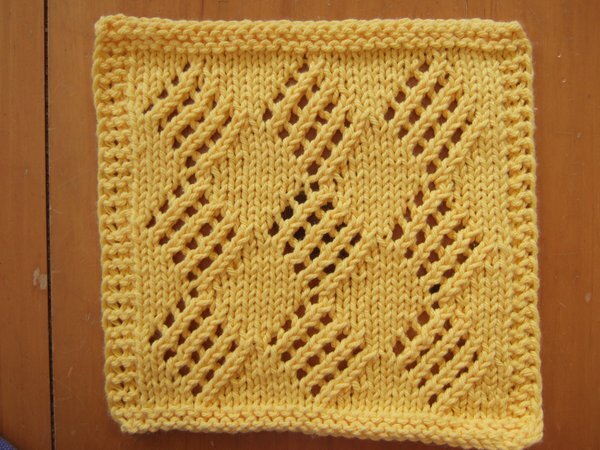 Bold sections indicate the main part of the pattern. 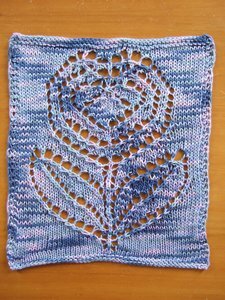 Non-Bold parts are the border; you can substitute any other border you like. 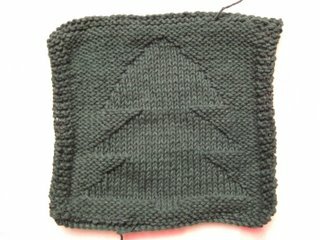 RT (Right Twist) = K2Tog, leaving stitches on left-hand needle. 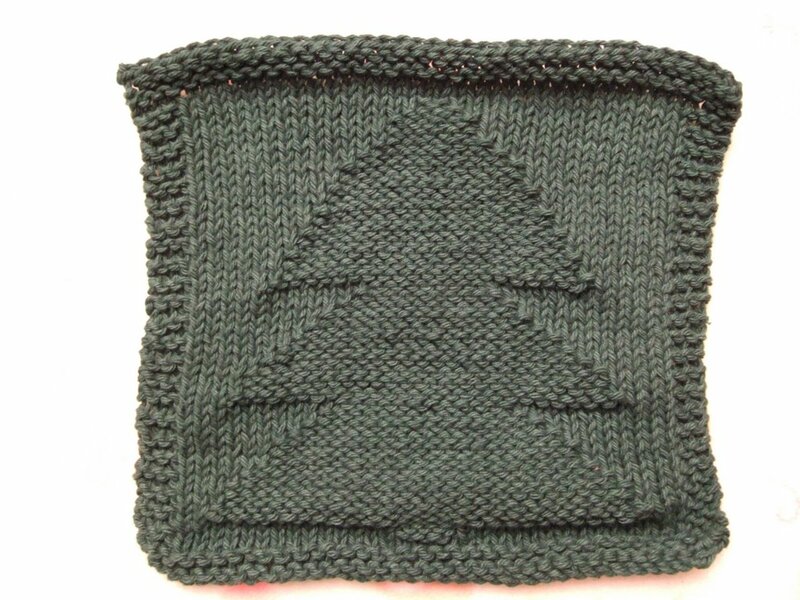 Then insert right-hand needle from the front between the two stitches just knitted, and knit the first stitch again. 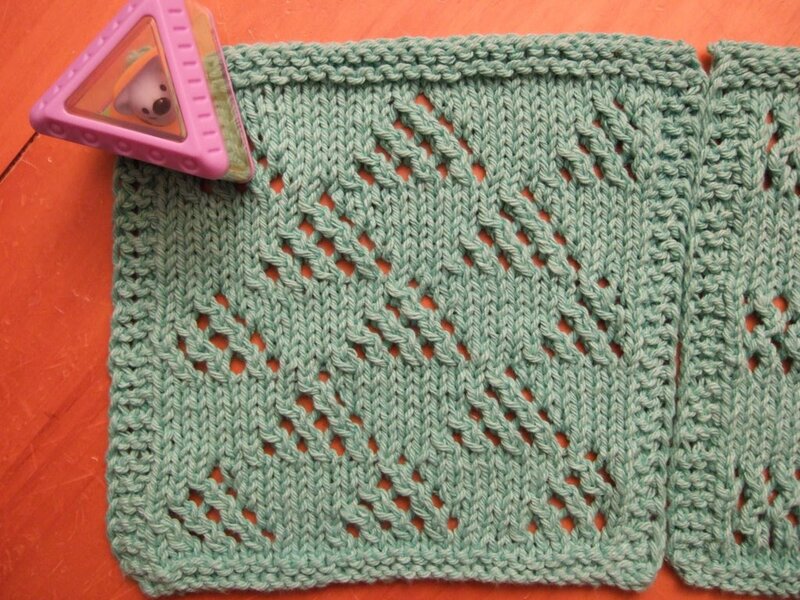 Then slip both stitches from the needle. 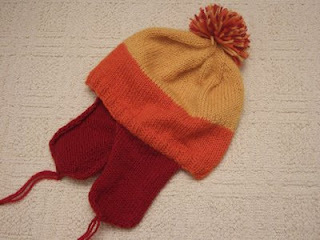 LT (Left Twist) = With right-hand needle behind left-hand needle, skip one stitch and knit the second stitch in back loop (viz K1-B or K TBL). 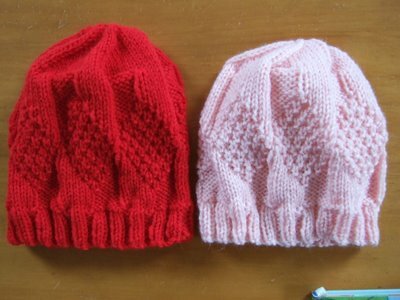 Then insert right-hand needle into the backs of both stitches (the skipped stitch and the second stitch) and K2Tog-B. 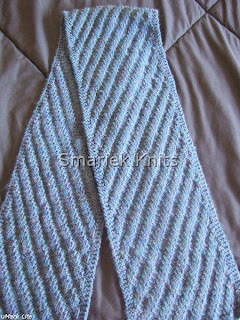 Slip the first stitch of each row purlwise with yarn in front for a nice edge. 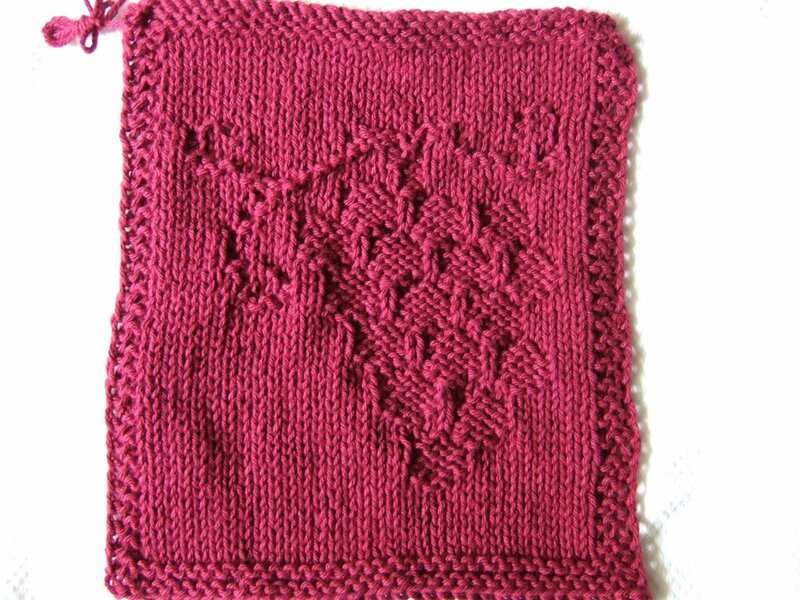 I made this Grapes Dishcloth to go with the Wine Bottle & Glass dishcloth. 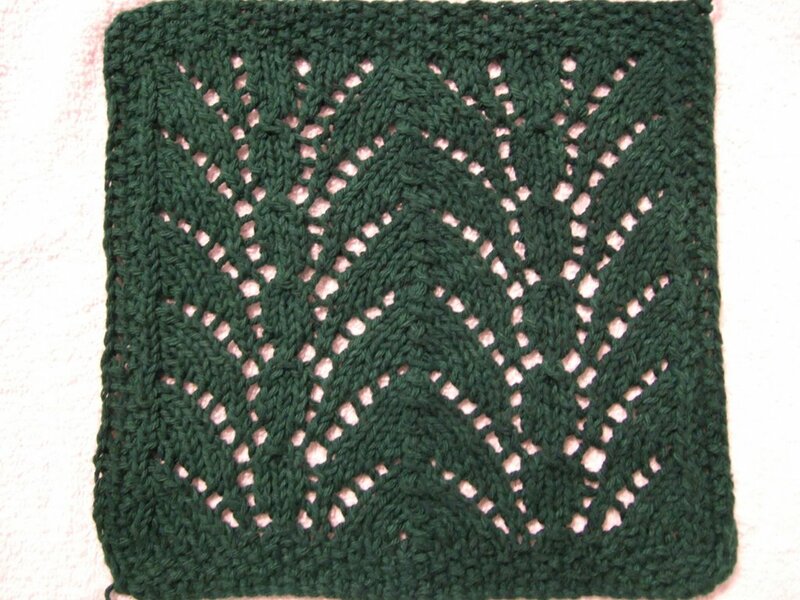 I was thinking of making this dishcloth with purple yarn, but I didn't have any on hand and it could be aeons before I get any. 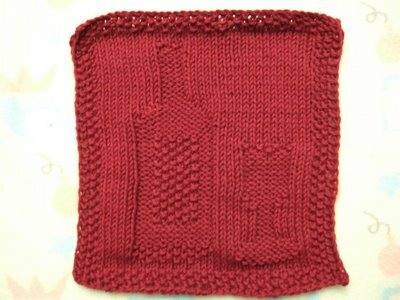 So I went ahead and knitted this up using the same Wine colored yarn. 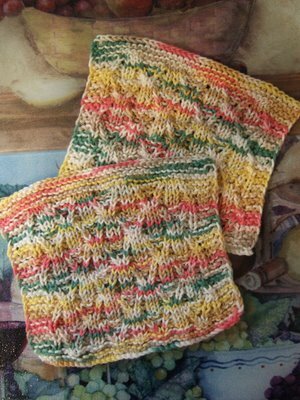 Both dishcloths are RainyK creations, and they're both "oversize" dishclohs. 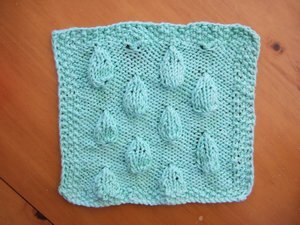 This Grapes dishcloth is roughly 8 inch by 9 inch (20 cm by 23 cm). 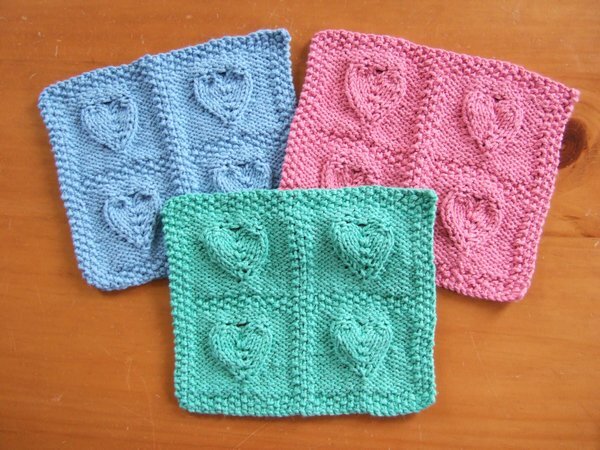 Of course, I'm not quite sure what the "standard" dishcloth size is. I just know that these two are by far much larger than my other ones. 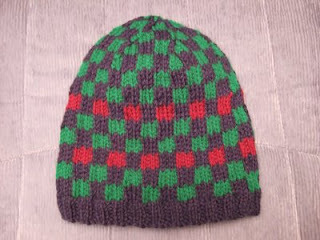 I hadn't gotten around to weaving in ends when I took the picture of this cloths. 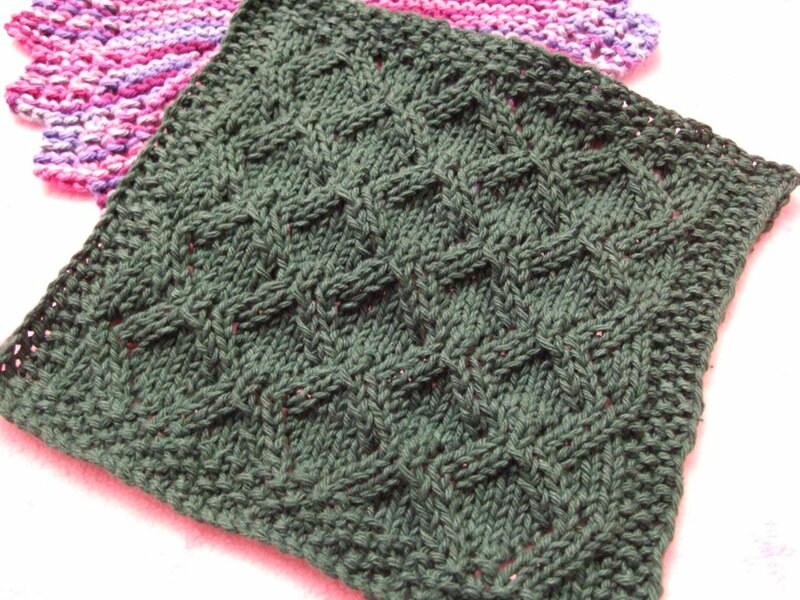 Weaving ends is one of my most hated tasks. 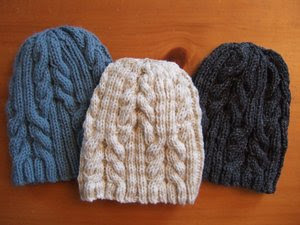 I think I'll batch up a few cloths and weave all the ends at the same time. Here's a dishcloth with a wine bottle & wine glass pattern on it. It is one of Rainy K's patterns. This one is also slightly trapezoidal like my other dishcloths, except that it is wider at the bottom instead of the top because this dishcloth was knitted from the top down instead of bottom up. 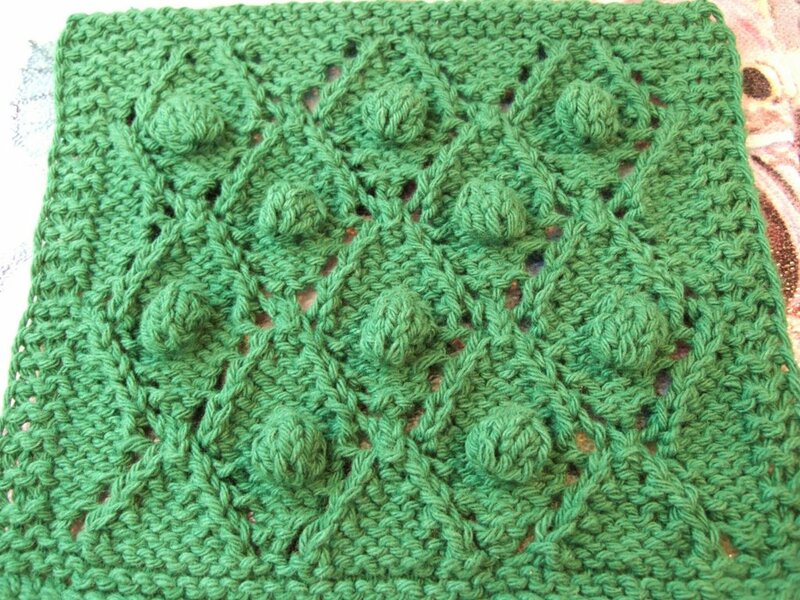 I enjoyed working on this pattern. 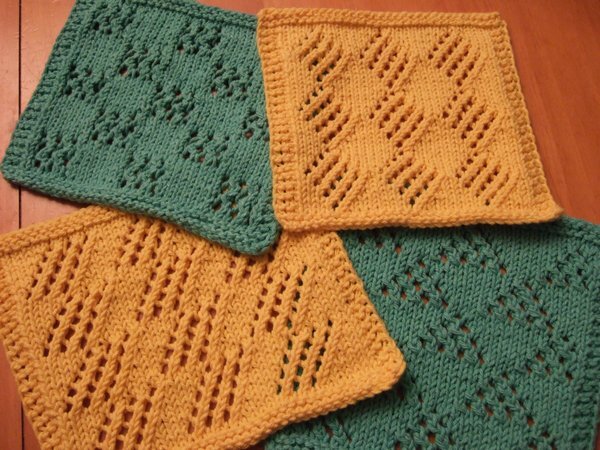 I'm going to knit a few more dishcloths that "go" together. 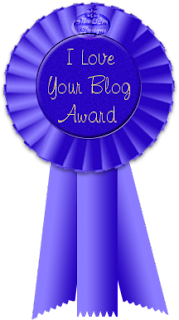 So there will be this one, one of just a wine bottle, one of just a wine glass, and one of grapes. 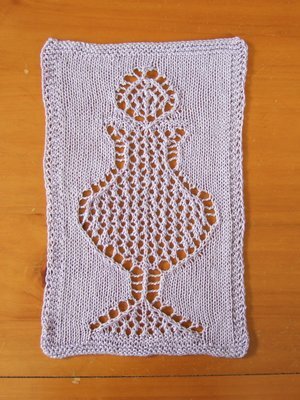 I'm thinking purple yarn for the grapes; I'll need to pick up some purple cotton yarn for this. 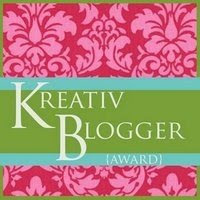 Not sure what color to use for the wine glass or wine bottle. What would you use? 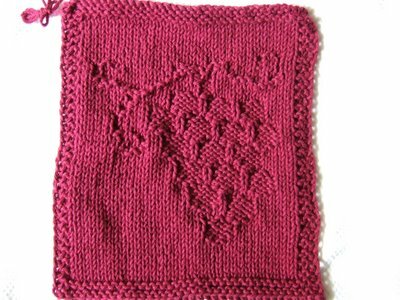 I thought it would be boring to use the same color yarn is this dishcloth ... but the other yarn colors I have are pink variegated (as you have seen in my three other pink dishcloths), pine green, light blue, and this wine color. 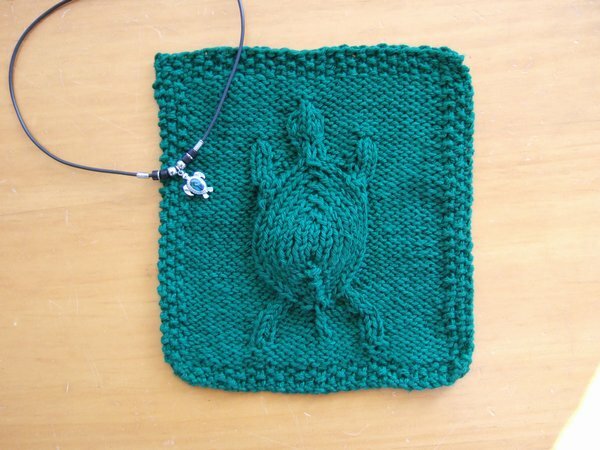 This dischloth is also more rectangular than square. 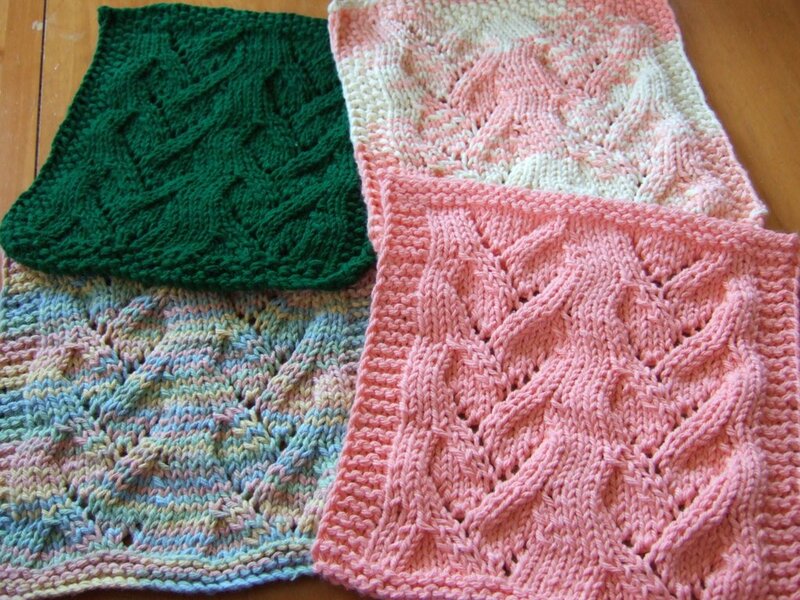 It makes me wonder how people knit a bunch of different squares and then manage to sew them all together to make an afghan. 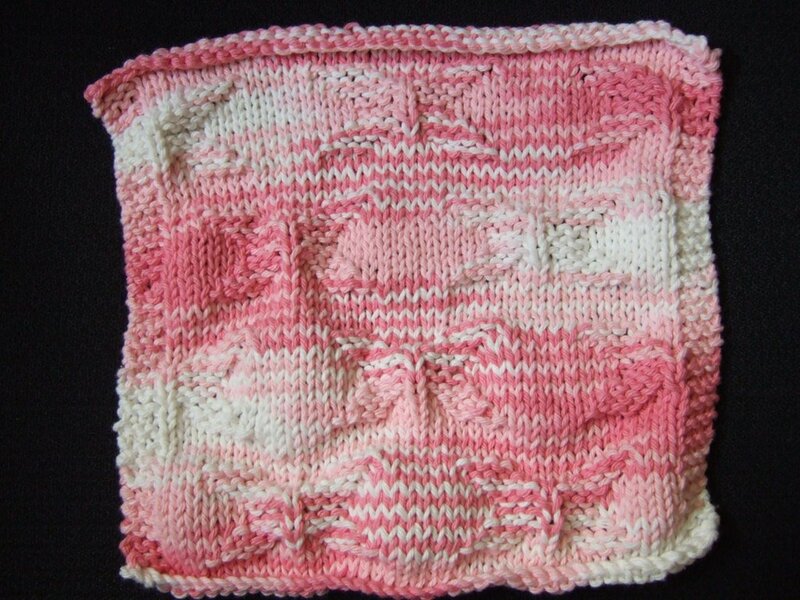 I would imagine it very challenging if all the squares were not the same size. 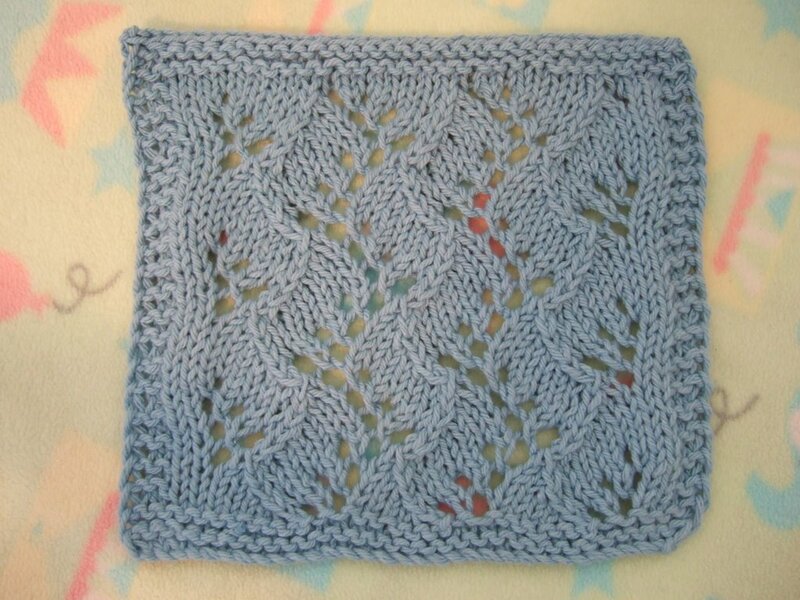 Here's my first non-pink dishcloth. :) I hadn't thought about which side would be the front, so I weaved in the ends on the side where the Christmas tree pattern is knit. In retrospect, I probably should have done it the other way around, by weaving in the ends on the side where the tree is purl. You can see the ends in the picture above because I haven't snipped them off yet. I dunno, what do you think? 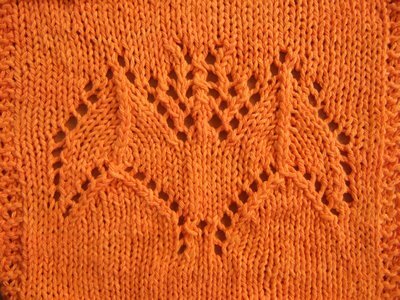 Should the pattern be the purl side or the knit side? 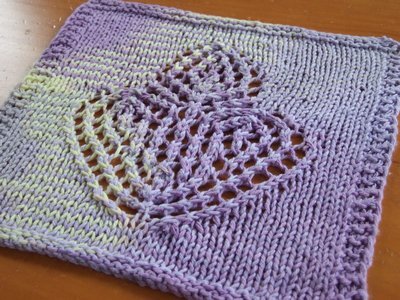 This is a pattern from Purple Duckie. 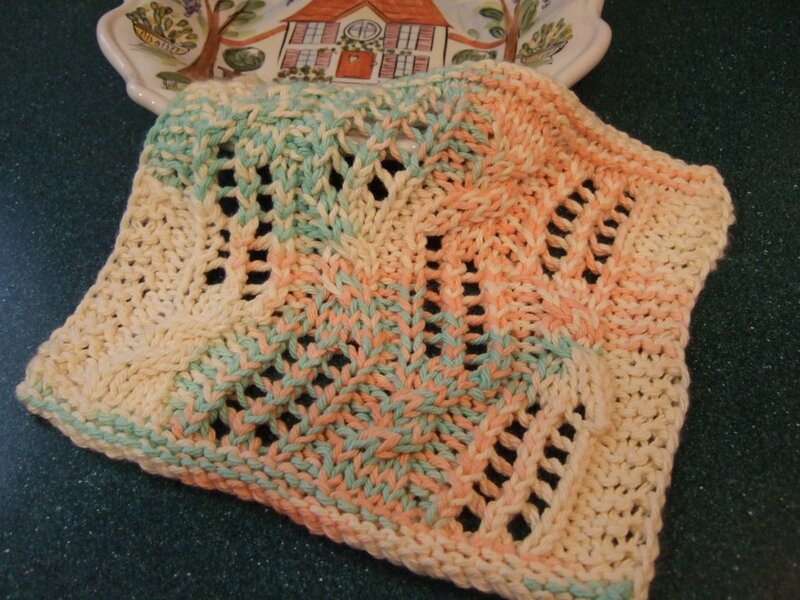 This dishcloth, like my Spring Butterflies cloth, is also very slightly trapezoidal. Of course nobody but myself would probably notice it. 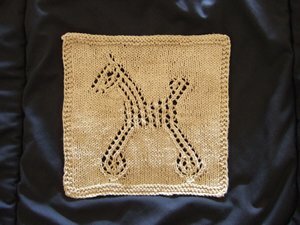 I think my next Christmas themed dishcloth will be Melissa's reindeer. 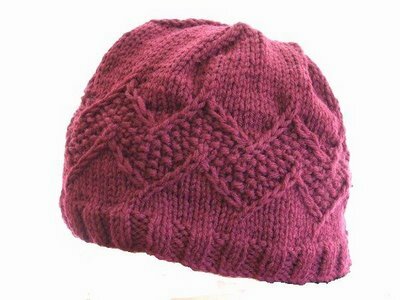 This pattern was easy to knit with it's big section of purls and knits, rather than having to alternate purls/knits a gazillion times throughout a row. It's just a matter of counting. 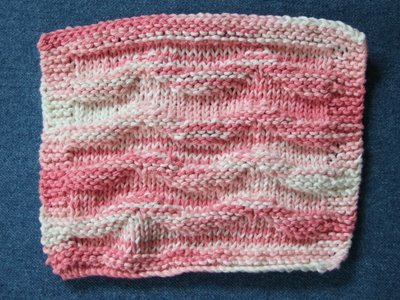 Yes, it's another dishcloth with the same pink/white variegated yarn. 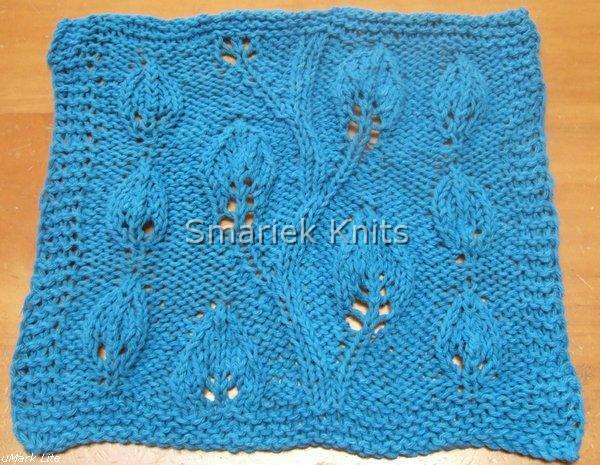 In fact, it's my third one in this yarn. But not to worry, I have picked up some cotton yarn in other colors and will be knitting up something non-pink before the next Ice Age. 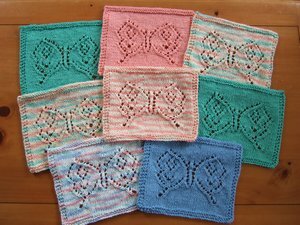 This Spring Butterflies pattern doesn't seem to show up very well with a variegated yarn. I think it would look much better in a solid color. I'll have to try it again using a solid and see how it compares. 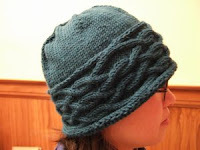 I also want to figure out how to get the edge to stop curling so much. 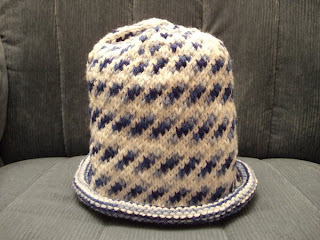 This one is also very slightly trapezoidal, the top edge is just a little wider than the cast-on bottom edge. 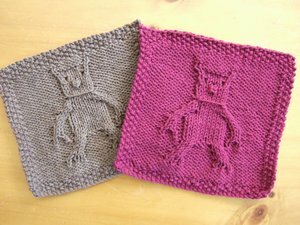 I guess my tension changed as I knitted, or it had something to do with casting off. 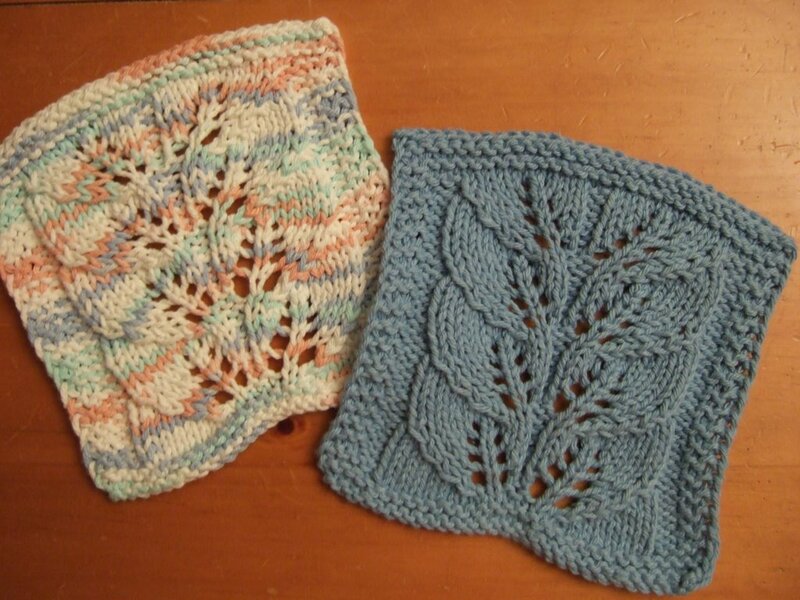 I also need to figure out a new way to cast-on, as my cast-on edge never matches my cast-off edge. 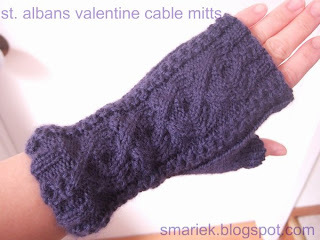 I'm currently using a cable cast-on. 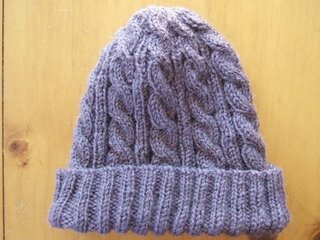 I wonder what other cast-on method I should try? 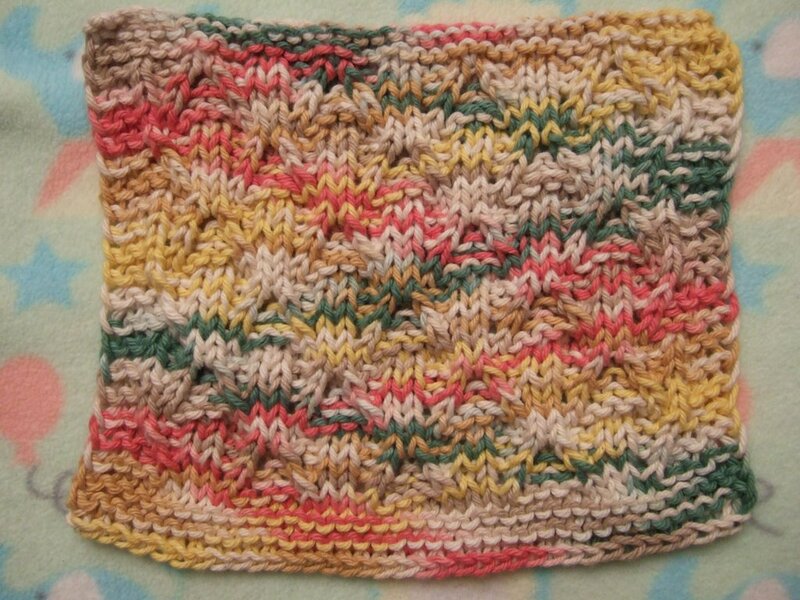 This Wave Pool dishcloth is my second knitted dishcloth. 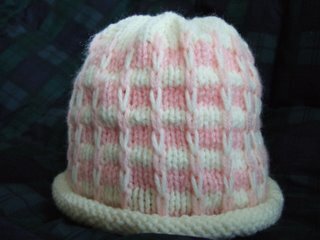 I managed to knit this up while my little girl was napping, while my mom watched her, and a bit during the evening. 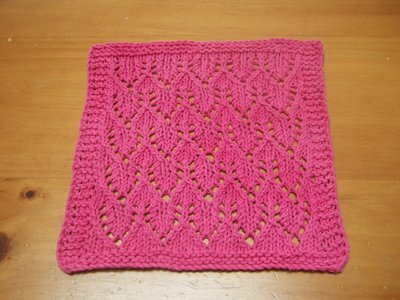 It's in the same pink yarn that I used for my Grandmother's Favorite dishcloth because I'm still working on that cone of yarn. 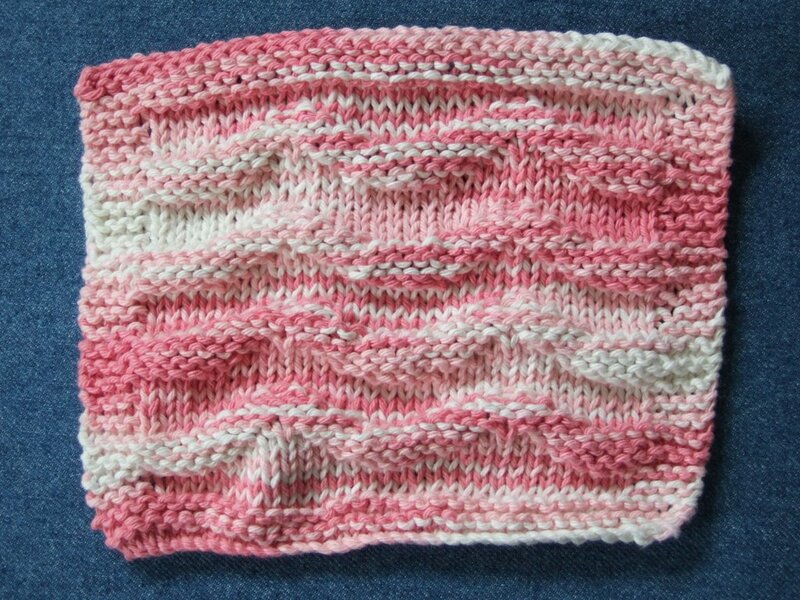 I think this Wave Pool dishcloth would look nice in blue or a blue variegated yarn. I don't have any on hand so will have to get some to try it out sometime. 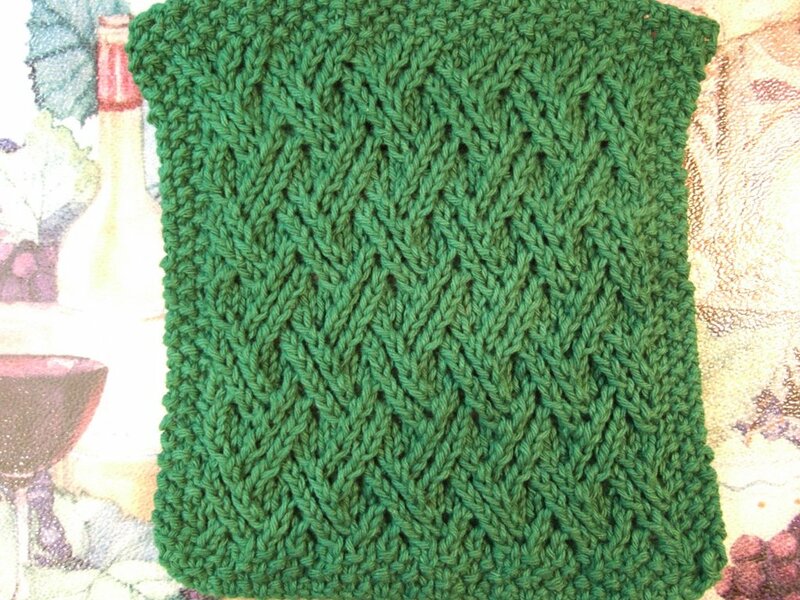 I really need to get more of this cotton yarn. 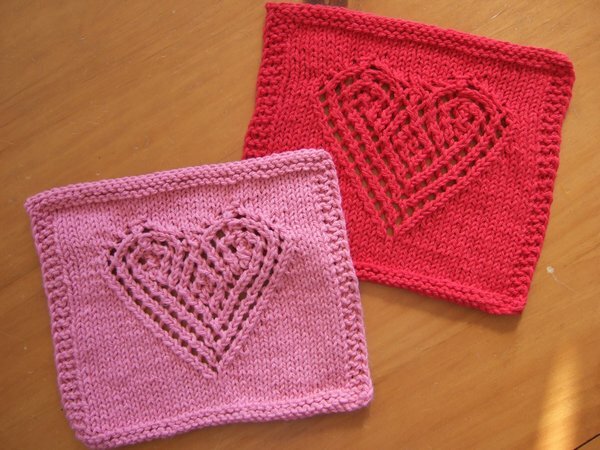 We can't have everything in pink, can we?